This text is designed to help teachers work with beginning and intermediate ESL and ELL students in grades 5 to 12. It provides lessons and activities that will develop the students' vocabulary, English usage, and mathematical understanding. A balance of high-interest activities, cultural sidebars, vocabulary review, and chapter tests reinforce mathematical concepts in English. 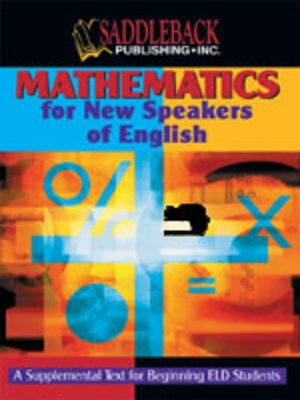 Features include: Six chapters cover the basic math skills in English. Creative illustrations help add visual cues to problem-solving. Emphasis given to learning pronunciation of words and numbers in English. Multicultural notes and sidebars.